There’s a new treasure-hunting experience in your parks created to make you smile! 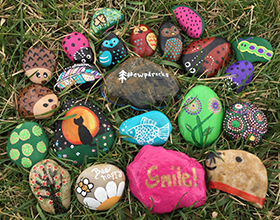 We’ve been busy painting rocks and hiding them in CWPD parks. Now it’s your turn — go out and find them! Create your own masterpieces and leave them for someone else to find — it will make their day! When you find a CWPD rock, snap a photo and post it to the CWPD Rocks Facebook Group. Or post on Twitter or Instagram with the hashtag #CWPDrocks! You can post clues to your rocks on the group or just let people come across them on their own. If you find a rock, you can either rehide it or keep it for your collection!